It is fashionable to wring one’s hands about the impending demographic crisis that is about to hit the developed countries, at least amongst those who want to be seen as serious. There is no doubt that social programmes will need to change over time, but that should not be a shock: one of the definitions of something being dead is that it does not react to changes in its environment. In this article, I look at the demographic situation for the United States, and offer a high level explanation why it is not particularly worrisome. In order to be brief, I am looking only at the capacity to produce real goods and services here, and not the financial measures that are the usual justification for panic. The charts above is about the “scariest” one I could come up with for the demographic outlook. It shows the percentage of the population that is 55 years or older. It is rising inexorably, higher, and the usual worry is how can we provide for all of these people? However, this is just looking at one part of the situation. The flip side of the aging population is that there are people who below the working age. The chart above shows the percentage of the population that is in the “prime working age”: 25- to 54-years old. 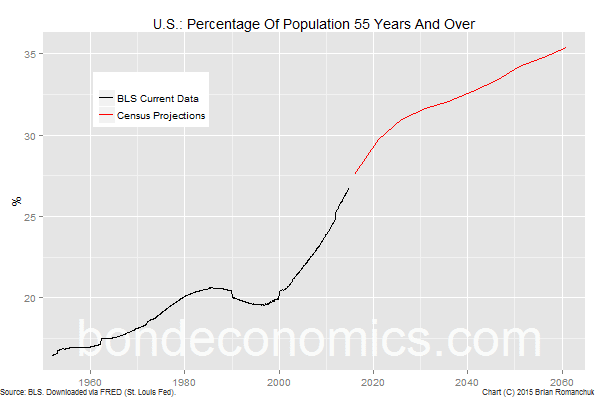 (The historical data and the census projection do not line up; I assume that this is the result of the exclusion of the institutional population within the BLS data series I used.) Although this percentage will drop going forward, it was actually lower in the mid-1960s. 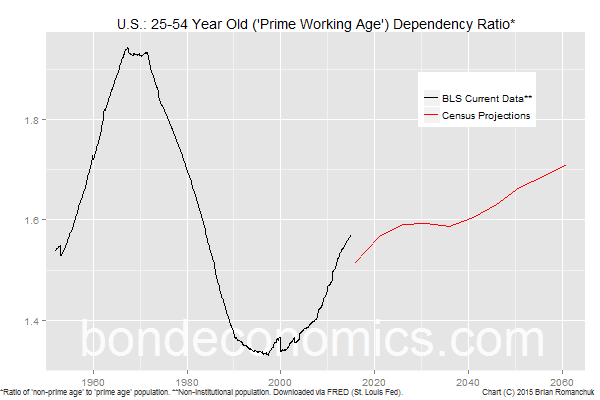 Ultimately, the “dependency ratio” (the ratio of “non-working ages” to “working ages”; shown below) is not hitting some extreme level that will make it impossible to provide for societal needs. One could argue that children are expected to be provided for by their parents, whereas retirees draw Social Security and pensions. But society also has to pay for education, and many retirees will draw down housing, retirement and pension assets, and those transactions will generate considerable tax revenue for the government. People can work longer than they had planned. Given the widespread failure of market-based retirement provisioning, this is happening already. The economy can return to something closer to full employment, eliminating widespread underemployment. Production does not depend upon how many people are in the 'working age' demographic; it depends upon how many of these people are employed. This alone could compensate for a large proportion of the projected demographic shift. A more sensible attitude could take hold in higher education; students would not spend years in university to end up working in a café. The “requirement” to have a Master’s degree for jobs that were previously filled by undergraduates will disappear. By spending less time in educational institutions, people will end up with longer working lives. If the labour market were properly functioning, these adjustments would happen naturally as it tightens due to demographic pressure. That said, there is no sign of this happening yet. Although capitalist economies are meant to be populated with forward-looking firms, in practice, management is myopic and only responds to short-term price signals. (The ongoing overproduction of crude oil by high cost producers at a loss is the latest example of how short-term thinking wins over long-term planning.) Therefore, there is no reason to expect adjustments to occur now in response to pressures that will appear in coming decades. I am not hugely optimistic that any transition will be easy, but reality will eventually force a solution of some sort. I am going to avoid saying anything detailed about Social Security here. The topic has been highly politicised, and a fair amount of nonsense has been thrown around. It is entirely possible that the programme will need to change parameters as time passes, but my first pass analysis seems to indicate that the changes need not be very large. Much of the analysis of the programme takes place using the fiction that Social Security can be analysed as would a corporate pension plan. We cannot analyse the U.S. Federal Government as if it were a business; we have to analyse government finances by looking at the aggregate behaviour of the economy (I discuss this in the context of government pensions here). In a service economy all that will happen is that services will shift towards the elderly and some services that engage people at the moment will cease engaging people and either be replaced with a machine or simply not happen. Where market forces don't sort that out (and there's no evidence they will) then government is going to have to start picking winners. Just as they do in a war economy. Which means going beyond price as the sole arbiter of value. Double negative alert (? ): "... there is no reason to believe that goods and services will not be in short supply..."
Thanks, good catch. I must have mangled that sentence during editing.